"There are a few different Android ports for Windows Mobile devices and each one supports a different family of device; each family of device has a varying amount of hardware support. Most phones will support the touch screen, hardware buttons, cell phone radio, and data connection, but some ports may not support bluetooth, GPS, or power management. This is not a complete list of Android ports available, but it should cover the most popular Windows Mobile phones." Curious about Android but can't bear to leave your Windows Mobile device? How-To Geek has instructions on how to dual-boot Android on your WM device - without wiping Windows Mobile from the onboard ROM. Note that not all WM devices are supported (mostly older ones, and primarily HTC models), but this is one fun hack that you can play around with. If anyone's brave enough to try this, let us know in the comments how you get on! I've been running Android 2.1 ASOP from SD card on my HTC Tilt 2 (AT&T version of Touch Pro 2) simply by copying the unzipped Android folder and boot by launching Haret.exe bootloader. Windows Mobile completely untouched and ready anytime soft resetting. Nothing could be easier and more satisfying having very responsive Android to do nearly everything with. Major exception for Touch Pro series is lack of non-call audio (due to hardware issue). Phone fully functional otherwise, vibrate used for ringing. Wifi works and Android Market loads all available apps. Highly recommended trying this out totally free and no more commitment than a 350MB folder on SD card. There's Android as CAB file and RAR file, the CAB wouldn't install for me, the RAR worked first try. A FULL (vs Quick) formatting of target SD card with PC first helped out also. Last edited by bmhome1; 07-12-2010 at 05:56 AM..
bmhome1, thanks for the feedback. Now I'm intrigued enough I might try it myself. The single issue I've found is that the SD card root does accumulate various extra folders related to apps installed into the Android OS and WM based folders such as DCIM photos will have a secondary .thumbs cache from Android. So, if one chose to cleanse all traces of Android, needs some simple cleanup tasks only IF Android used WM-based folders. But, other than that the two OS happily are blind to each other and risk nothing. It's a real Android experience, not just a VM (Windows is shutdown), so most hardware resource is used. Nothing as fluid as a Nexus Snapdragon, but an amazingly smooth performance. I've installed versions 2.0, 2.1 and even an early peek at Froyo on the trusty Sprint Touch (aka Vogue). Although there isn't much processor and the memory is rather anemic, Android runs pretty well on the phone. I eschewed the usual HARET (SD Card) install and flashed the Android directly on the the ROM of the device to get a better feel for it. I was impressed with the connectivity and capability. 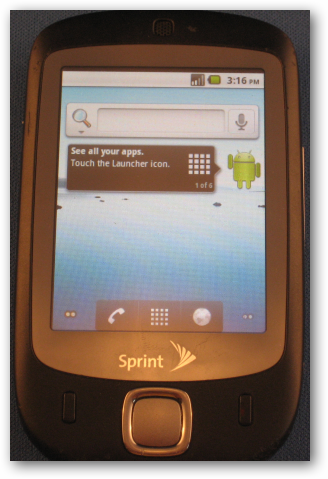 However, as a long-time user of Windows Mobile 6.0, 6.1 and 6.5 and Palm's WebOS most recently, I am not as impressed with Android as I want to be. It appears to be an operating system written by geeks for geeks (and I mean that in the nicest possible way!). One simple example is accessing extra keys on the keyboard such as an accented letter-a. If you touch and hold the letter A it will show the four or five accented choices. On several soft keyboards I've used, you then slide over to the one you want and release. The accented A gets inserted and the choice bar disappears. If you want none of them, you just raise your finger and the choice bar goes quietly away. On the Android keyboard, you get the choices AND a little box with an "X" inside so you can close this window. Who thought THAT was a good idea? There are little items like this all over the Android UI that make it hard for me to choose it. I've loaded the Froyo 2.2 Blazin version, and it's FASTER to boot, SMOOTHER running and shuts down faster. I've installed +20 apps (all freeware) and nothing has bogged down or became slower. Truly impressive. If they can get non-call audio functional it will be a real dual-boot option. I recently gave up my Iphone to go back to Windows Mobile. I'm so much happier now than with the Iphone. Still, I wanted to see what the hype was about with Android so I dual booted my HD2 several times into 2. and to Froyo. While the OS is neat, it did not seem quite as polished to me. It was serviceable to be sure, but I went back to WinMo because it's business friendly and Android isn't quite there. Yet. It will be and I will keep abreast of it's progress. One main issue I had that had nothing to do with being business friendly was addressing the SD card for storage while in Android. Because of the dual boot from the SD, Android does not easily see the extra SD storage space. Another issue I had was syncing with Outlook without paying $30 or $40 for software that Google should have released for free if it wanted to attract the business market.